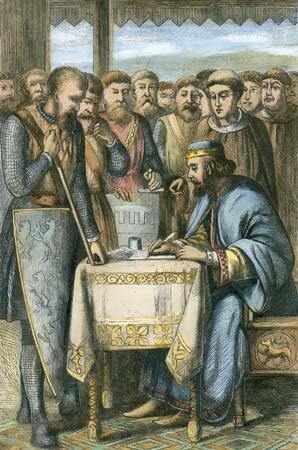 In case you missed it, Wednesday marked the 896th anniversary of the signing of the Magna Carta, one of the most important documents in the Anglo-American political tradition and, I would argue, in the political tradition of the West generally. The Magna Carta put significant checks on the arbitrary exercise of authority by the King John of England. Nobles were to be tried by a jury of their peers rather than by judges representing the royal interest. All freemen were promised protection against arbitrary arrest or seizure of their property. John also promised that he would stop interfering with the English Church. The Magna Carta even guaranteed a uniform system of weights and measures throughout the realm. This recognition of the liberties of subjects by the Crown became a fixture in the English legal tradition. Jurists and political figures of later centuries in both Britain and America continually pointed to the Magna Carta as the legal starting point for our tradition of limited government. So if you enjoy the Bill of Rights, thank some rebellious barons of the 13th century. The text of the Magna Carta is linked here for your perusal. This entry was posted in Uncategorized and tagged government, Law. Bookmark the permalink. Good reminder. When I teach my Intro to Comparative Poltics class, this is one of the first documents that I call to my students’ attention. In the modern West, it started that tug-o-war between the ruler and the ruled, even though the ruled in this case were also of noble birth. I’m guessing that Fitzwalter and company had no idea what they were starting, and instead were just interested in protecting their own junk. Funny how little things like that can have a dramatic long-term impact. It is rather interesting that the textbook that I use as an anchor for the the Intro CP course had a chapter on Britain that didn’t focus much on the Great Charter or much else of British history, despite the textbook having a theme that “history matters.” Initially, in the early versions of the textbook, the British chapter essentially started British history with the Labor resistance to Margaret Thatcher. Magna Carta? Enclosure movement? English Civil War? Glorious Revolution? Bah, humbug! None o’ that stuff mattered. Subsequent editions have improved upon this lack of historical rooting, but I am really struck by how many people do not see the significance of the MC, and instead just write it off as a document among elites that defended aristocratic wealth. So…is there a text book that you like? Interestingly, I never even heard of the MC until I started teaching history in my homeschool. The way events build upon past happenings now is a very fascinating study to me. Thanks for letting us know about the BDay.